Courtroom drama. Cunning cross-examinations. Perjuring witnesses. Framed death row inmates. Government witness lawyers who ran with Al Capone. Assassination plots. Secret FBI wiretaps. Four trials and 20 years of deportation assaults by the government. Even after the Supreme Court called it a relentless “crusade,” a veritable case of “man’s intolerance to man,” the Executive lawyers and FBI investigators still pursued relentlessly the imprisonment and deportation of one man, Harry Bridges. And this legal war was waged in the middle of the Red Scare and the Cold War in the mid-20th Century, at a time when Americans were in great fear of the perceived communist threat. Whether our federal courts protected due process in the face of the relentless onslaught against Harry Bridges is a central topic in Burning Bridges. 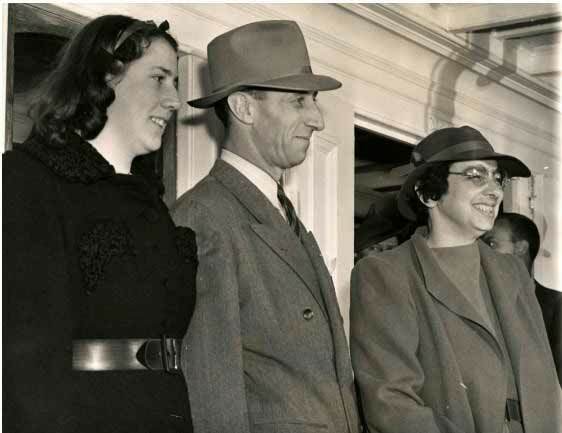 As he prepares for his first day of trial in 1939, Harry Bridges is flanked by his daughter Betty (left) and his civil rights lawyer Carol King (right). Defended by skilled lawyers who risked arrest and prison themselves for defending him, Harry Bridges’ legal defense team were lions of their era. From famed civil rights lawyers like New York’s Carol King to colorful trial sluggers like San Fransico native Vince Hallinan even to veritable statesman of the law such as the renowned Nuremberg Prosecutor Telford Taylor, Burning Bridges is also the story of the critical role brave lawyers serve in our democracy as they fight the government’s legions of lawyers and FBI investigators and as they face public scorn and intimidation for defending the innocent under the Constitution. And the scary questions Burning Bridges explores are questions that haunt us today, questions that revolve around how and why such institutionalized persecution of people who offer different viewpoints can happen today in an immigration system even more politicized and beholden to Executive control than in the last century, questions that go the heart of the American legal system and the heart of the guarantee of due process. 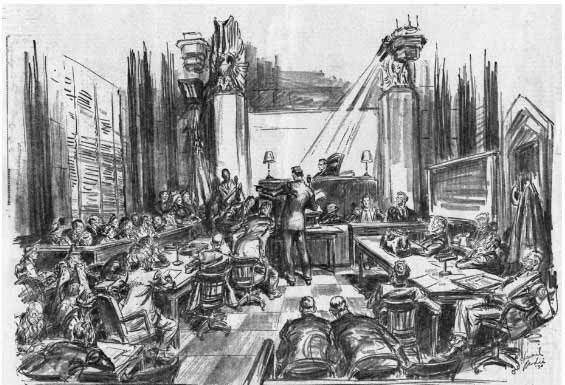 Courtroom drama as captured by famed American illustrator Howard Brodie. Copyright Howard Brodie Estate, courtesy of the Estate. The question Burning Bridges asks and answers is the why and how of governmental persecution of people who challenge our social, political, or economic norms. How does the legal system get warped by its constituents to destroy one man? How does due process get subverted to serve the purpose of a crusade rather than truth and justice? How do people defend themselves and stand strong in the face of such injustice, and how do they ultimately prevail? Where do our neutral, world-heralded Article III federal courts stand in this drama against the FBI’s tactics–on the side of due process or the side of a crusade too? 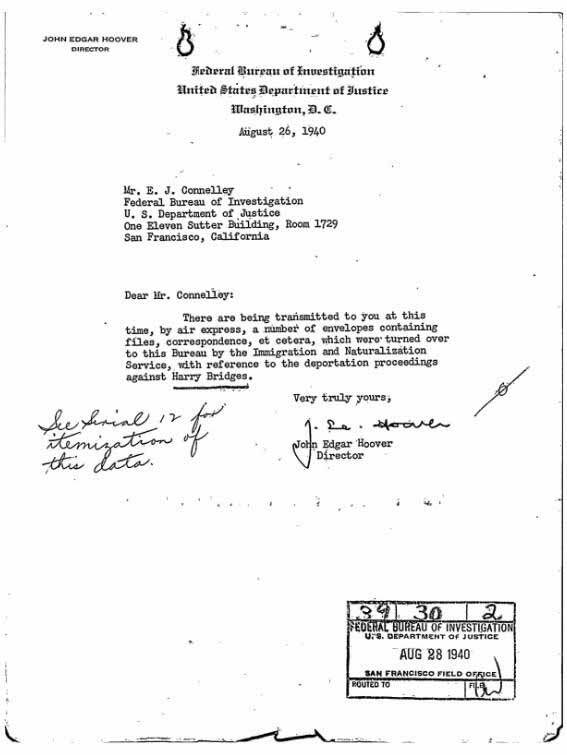 J. Edgar Hoover was so interested in the deportation assault on Harry Bridges that he personally traveled to the West Coast to oversee the launch of new FBI Investigations in 1940. This letter personally signed by Director Hoover comes from the FBI’s vaults.